I don't really have serious problematic skin besides the following: redness on my forehead, oily forehead, sometimes dry patches on my chin, and if I'm not careful acne will slightly breakout on my chin/temple/nose area. Though, during the summer months my skin is more prone to oiliness [especially my eyelids, forehead, and just all over my face]. If you have serious oily skin and acne prone skin, check out Gaby's skincare post for her tips and advice. 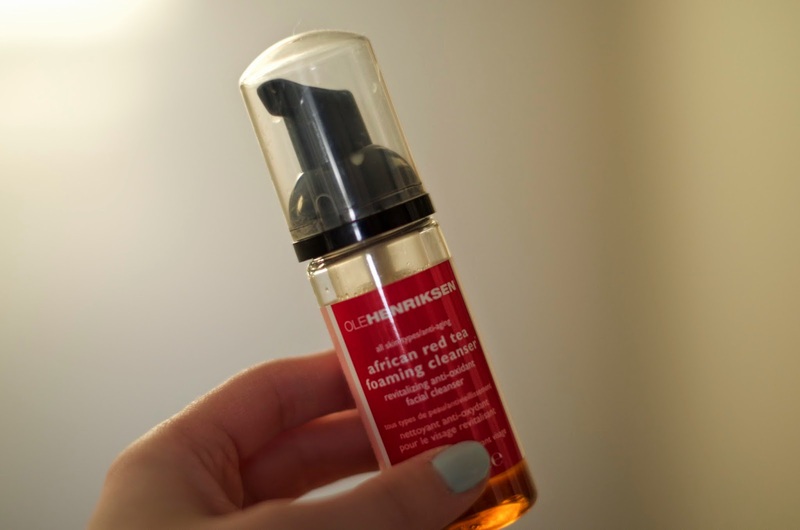 Ole Henriksen African Red Tea Foaming Cleanser -- I picked up this face wash during Sephora's Black Friday sale for $10, and I've been loving how it works for my skin. It has helped with making my face clear, even toned, and I've had hardly any breakouts since I've started using it on a regular basis. Of course, this face wash is expensive, but then again most skincare products are and you pay for what you get. When I use it: I like to use this face cleanser in the morning when I wake up and evening right before bed to remove my makeup. 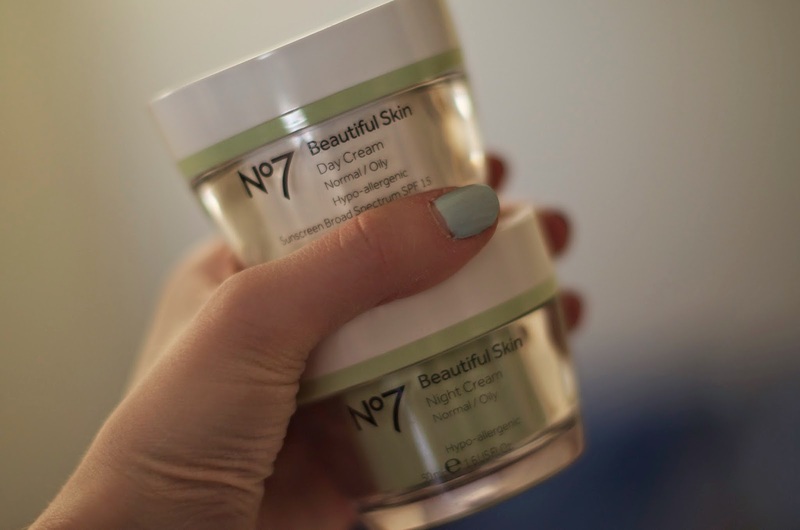 No 7 Beautiful Skin Day/Night Cream for Normal/Oily Skin -- Gaby gave me the night cream to try out last year, when it made her breakout when ever she used it. This stuff is amazing, and doesn't break me out either, which is awesome since most natural based ones would always break me out, meaning I would forgo using any moisturizer for several years. When I used it: I use the night cream right before bed after doing a face mask and/or scrub. The day cream I apply 5 minutes before doing my makeup for the day, as that helps create the perfect base for your makeup. 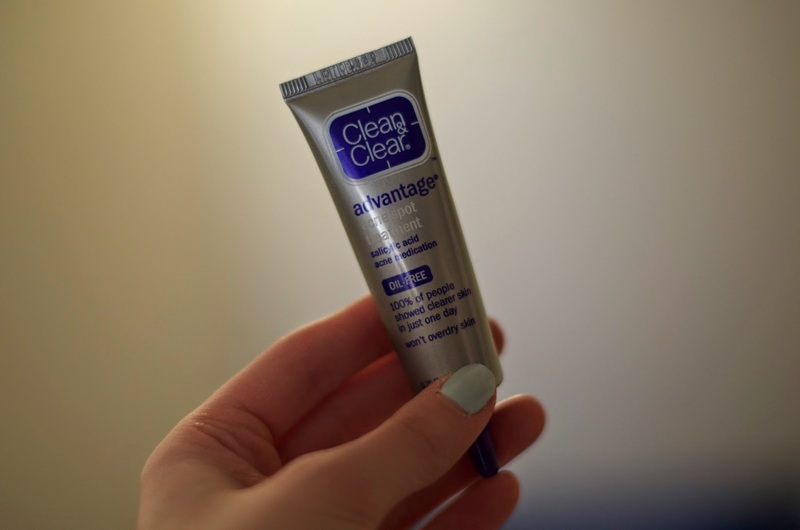 Clean & Clear Advantage Acne Spot Treatment -- This is hands down the best product for clearing up any acne spots that appear on your face. I've tried out several products over the years [a lot of natural products including tea tree oil] and nothing has worked as good as this acne spot treatment for me personally. When I use it: I only apply a little bit on any spots when they appear on my face, and then I apply it about twice a day. Michael Todd JoJoba Charcoal Facial Scrub & St. Ives Apricot Scrub -- These two scrubs are my favorite ones to use, the Michael Todd was a deluxe-sample from Ipsy [last year?] and I've been using it off-and-on since I received it. 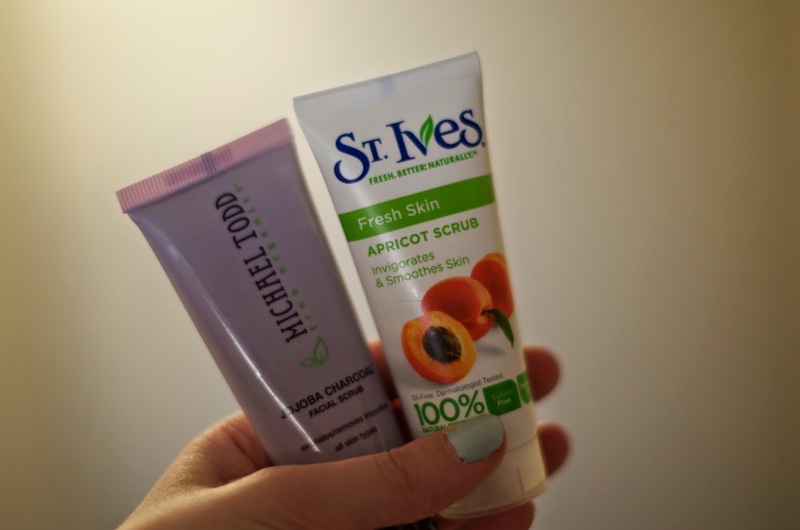 Whilst the St. Ives Apricot scrub was the first scrub I ever tried out, thanks to some readers suggestions, and can be found at Target and Ulta Beauty. When I use it: Once a week [though sometimes I become lazy and only use it once a month], or when ever my skin is looking clogged and/or flaky. 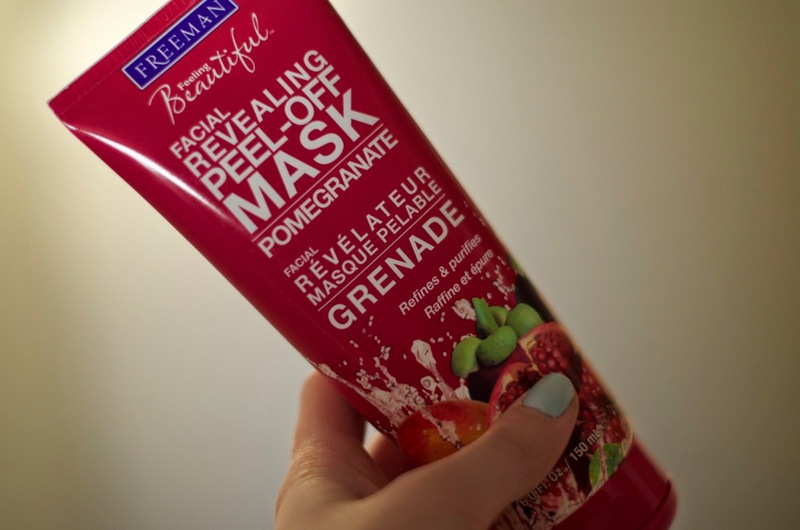 Freeman Cucumber Peel-Off Mask & Pomegranate Peel-Off Mask -- I only ever use Freeman face masks nowadays and these are my two favorite peel-off masks. 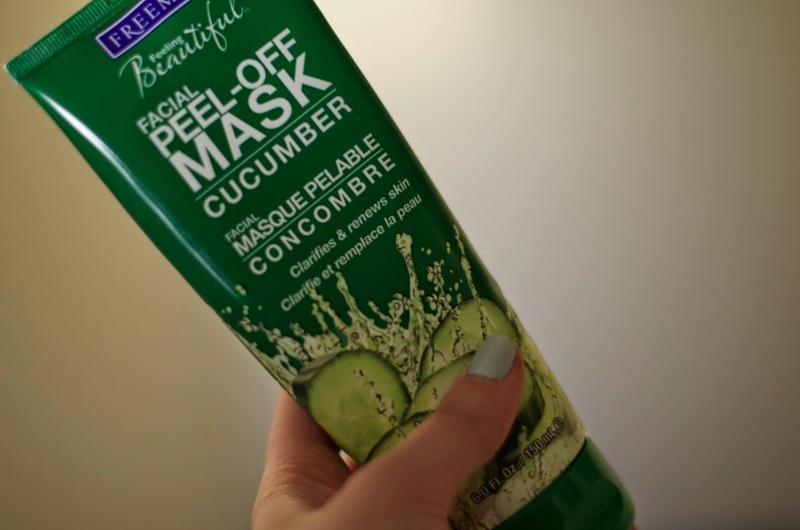 If your skin is ever looking dull, or just needs to be restarted try a face mask to help clear everything up. When I use it: When ever my skin needs a boost -- I aim for once a week, but sometimes I forget and go for weeks without doing one [then my skin goes wacko]. Yes to Grapefruit Face Wipes -- I'm not really tied down to any one kind of face wipes [I usually go for what ever is on sale from any of the following brands: No. 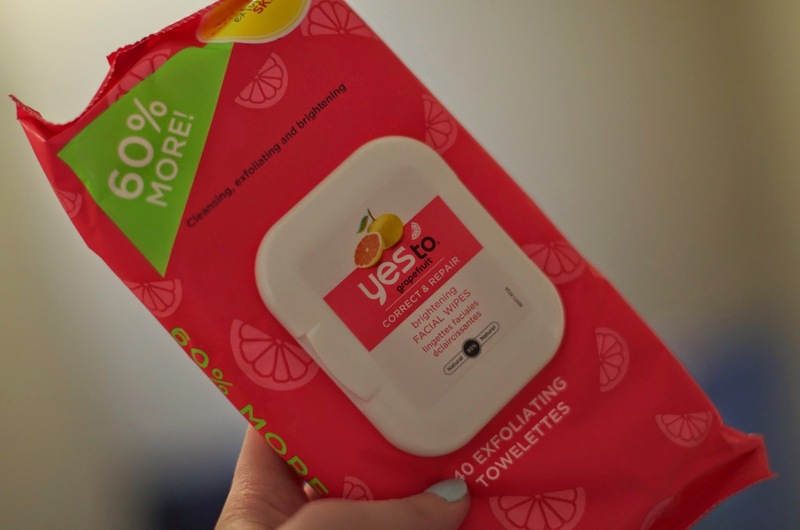 7, Simple, Yes to...], but I always find myself loving the Yes to... face wipes the best. My current favorite are their grapefruit ones which I find are the best for cleaning your face whilst on-the-go and don't have time to properly clean your face. What are your go-to favorite skincare products? I have been reading your blog for about two years now, and I absolutely love it! I just don't comment much. :) I was just wondering if you are into using natural skin care products. I've been realizing lately just how important that is. I noticed you use some of the Yes To products, which are marketed as natural. But I have to give you a warning about the St. Ives face scrub. I used it for about two years before i transitioned to natural products and it works very well, so that's not my point. The bad side is it is loaded with harmful chemicals! I don't know if you've done any research about Sodium Lauryl or Sodium Laureth Sulfate, but they are extremely harmful. They are mostly used it soaps and such (as a foaming agent) but they are also in the St. Ives scrubb. Here is an article that talks about the dangers of SLS/SLES. It's by Dr. Mercola who is a very well known natural doctor out of Florida. In addition to this, the scrub also contains Propylene Glycol which is another very harmful substance. Here is another artical that talks about Propylene Glycol as well as some other harmful substances in skin care products. I also remember running across an article somewhere (don't remember where sorry) that talked about St. Ives scrub being on the list of most toxic face substances. Anyways, I hope you'll at least take the time to read this. I've been realizing lately how big of a deal using natural skin care products is, especially for women because we use so many of them every day. Thanks for sharing the information on the St. Ives face scrub, as I had no idea. I picked up this scrub as a recommendation from some readers several years ago, and loved how it worked for my skin that I never really looked into [especially since skincare kinda confuses me]. 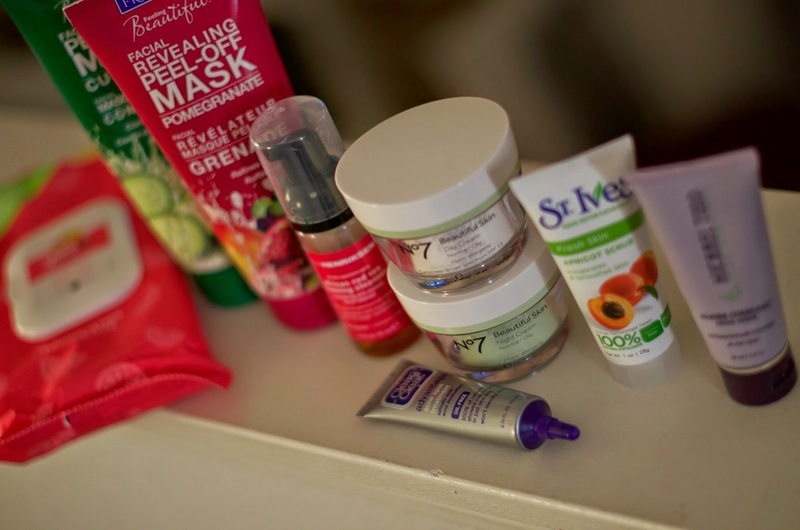 I use a mix of natural brands and non-natural mostly just what ever my skin doesn't react to, since I used to use all natural products during all my teen years and until I was 21 my skin hated me for it [it would breakout with everything I tried]. I have come to discover that more chemical based products and *some* natural products work for me. For example: the only Yes to... products I can use are the facial wipes as I breakout if I use the cleansers or moisturizers on my face. Crazy, huh? Anyhow, thank you for sharing your tidbits. I might look into trying a more natural based scrub after using this one up, but I can't make any promises that my skin will like it. Hello! I just started reading your blog about two weeks ago and I totally love it! We have to same kind of style so your blog is really helpful when I'm not sure how to style something . :) anyway, I easy thinking about subscribing to ipsy but I don't know much about it ...could you tell me more? Thanks a bunch! Also could you possibly do a post about how to stay fashionable and warm during the winter? As a wisconsin girl, I find that that is always a bit of a challange For me. Thanks again! I use the St. Ives face scrub too and I love it! Thanks for sharing!! It's always fun to see what others use for skin care! I'm going to chime in on the St. Ives scrub as well: it's simply not a good product. Aside from some questionable chemical ingredients, the main issue with it is that the abrasive particles in the scrub are pulverized apricot seed hulls. The edges of the hulls are extremely abrasive and sharp. Is it a good exfoliator? Yup! Use it on your elbows, your feet, your knees, or really anywhere besides your face. As a facial product, it is extremely poor quality and isn't doing your skin any favors. There are better products out there. Since you like to make informed posts, and since many young women esteem your opinion as the result of your reputation here and current work in a cosmetics store, please consider researching this product a little more carefully before recommending it as a "pick." Thank you for your opinion on the St. Ives scrub. I understand that there are some questionable things behind this scrub, and that it doesn't work for everyone. I personally have used this scrub for several years, and it has worked wonderfully for me. During my entire teen years and until I was 21 I used all natural products on my skin, and my skin reacted badly to them, so I switched to more chemical based products and my skin has become so much better. Whilst my sister, Gabrielle, can't use this product has she would react badly to it, and it would ruin her skin. Please understand that not everyone can go the all-natural route for their skincare [even if they would like to], and they everyone's skin reacts differently to different products. I'm not recommending this product for everyone, as it doesn't work for everyone, but it does work for my skin and I'm sharing that discovery. Just to clarify a possible misunderstanding, I'm not advocating an "all natural" regimen. I don't use one personally (actually, I mostly use Korean skincare products), and I agree, nothing is universally good for everyone's skin. My point was that the product is inferior to many, many others on the market, even within the same price range. My suggestion that you research the controversy surrounding this product was not motivated by a desire to convince you to use an all-natural alternative, but to encourage you to be better informed. In turn, that information would be passed on to your large readership. While it is perfectly fine for you to say "I recommend this product because it works for me", it is more responsible to say "I am aware that this product is known to be a problem for many people, but I recommend it because it works for me". Upon re-reading your post, it seems as though you have been using another product other than the St. Ives Apricot scrub recently. Hopefully, that one (or another like it) will work just as well for you. I have nothing against St. Ives products at all. Their Exfoliating Pads are a wonderful AHA treatment with a perfect pH for a daily-use AHA. Best regards to you! I always enjoy your posts. Yep, weirdo through and through!